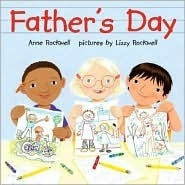 This is a story of a grade school class who is making a Father’s Day book for their fathers. Each child writes one page of the book. Eveline writes about a song her Papa sings to her at night. Evan writes about a camping trip he took with his dad. Jessica writes about her dad who lives in Texas and her stepfather who lives with her and her mom. Charlie writes that his dad is a terrific person because he has lots of friends. Sarah writes about cooking with her dad. Pablo writes about playing soccer with his Papi. Kate writes a poem about fishing with her daddy. Michiko writes about painting her room Summer Rose pink with her father. 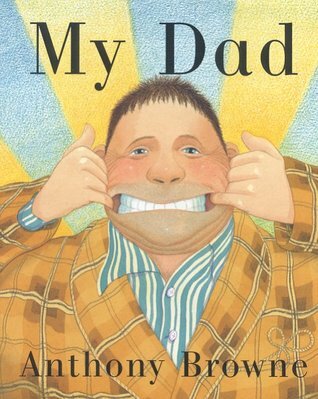 And Nicholas writes about reading with his dad because they both like the same kinds of books. The pages of the book get typed up and bound together. Then on the Friday before Father’s Day, all the dad came to school for a party. The children share their books with their fathers. Dad in the brown plaid robe and red slippers is everything to the child telling the story. He eats like a horse, and swims like a fish. He’s as strong as a gorilla, and as happy as a hippopotamus. In every picture dad becomes a horse, fish, gorilla, and hippopotamus in a brown plaid robe and red slippers. Dad is many things, but most importantly, he loves me! 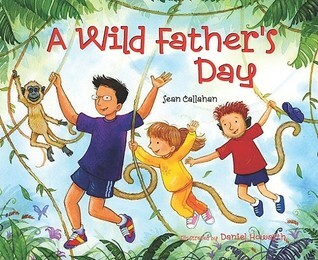 Early on Father’s Day the kids wake up their dad with a card that says ‘Have a Wild Father’s Day!’ And that’s just what they do. Dad decides they should act like wild animals all day long. They jump on the bed like kangaroos, they run like cheetahs, they swing like monkeys, they swim like dolphins, and eat like elephants. At the end of the day they sleep like tired little puppies. Every picture has the kids and dad acting like animals and on the next page there are animals who look strangely like the dad with his glasses and his kids.